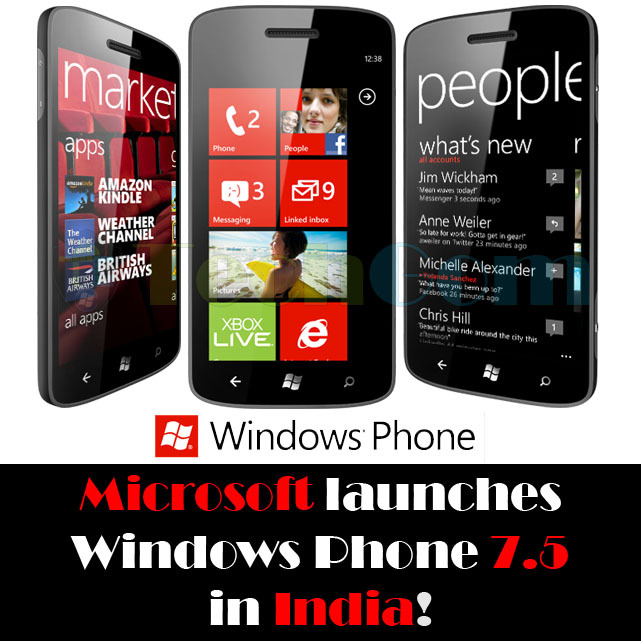 Microsoft on Wednesday launched its Windows Phone platform in India. The launch event took place at New Delhi. Microsoft announced that all upcoming devices from their hardware partners HTC, Samsung, Acer and Nokia will be running its latest Windows Phone 7.5 offering a.k.a Mango. All hardware partners except Nokia unveiled their Windows Phone line up for the Indian market. Samsung already unvieled its Windows Phone offering, the Samsung Omnia W in the last week along with two other devices. HTC launched the HTC Radar, which is a smaller sibling of the HTC Titan. We will provide you complete technical specifications, price about the HTC Radar later. Acer also showcased the Acer Allegro, which will be available in the market from November 2011. Microsoft brings Windows Phone platform in India almost one year after its global launch. Smartphones running Windows Phone are already selling in India, but it is only now that those users can use the Windows Market place in India, buy apps using their Indian hotmail/live id's. Google's Android smartphones are already selling in abundance in India. Microsoft thinks this is the perfect time to enter the Indian market, with an OS which can compete with other OSes currently in the market. People + social networking - Groups help you focus on the contacts you really care about—family, best friends, fellow soccer parents. Post updates to Facebook, LinkedIn, Twitter and Windows Live in one step. Threads - Start with a text, and finish in Facebook or Messenger chat (or vice versa). The whole conversation stays in one thread, and all it takes to switch back and forth is a tap. Linked inboxes - Juggling multiple accounts for personal or work email? Streamline things by linking them into a single inbox to see all the messages in one view (the accounts will stay separate). Custom ringtones – Create your own ringtones using MP3 and WMA files. Internet Explorer Mobile - It features hardware acceleration for faster, smoother web browsing, same engine from desktop version of IE9! Multitasking – Switch between open apps easily, pressing the back button for a few seconds. Pictures Hub and Camera – Use the camera button to snap a quick pic, even when your phone is locked. Your phone automatically detects untagged faces when you're uploading pictures to Facebook or Windows Live—just tap, tag, and post. MarketplaceMarketplace has an ever-expanding lineup of standout apps and marquee games, and it's now easier to find what you want in the online store. So start limbering up those gaming thumbs! Office Hub – It has mobile versions of Word, Excel, OneNote and PowerPoint for working on the go. These can synchronised back to SkyDrive, Office 365 or SharePoint sites. Games Hub – Now you can do more in the Games Hub—including track your achievements, dress up your avatar, and get messages from your Xbox LIVE friends. Visual voicemail – See your voicemails in a list, then listen to them on your phone. Internet connection sharing - Turn your phone into a mobile Wi-Fi hotspot by sharing your Internet connection with your laptop and other devices. The Windows Phone 7.5 is a fairly new OS and will take some time to have as many apps as Andorid or iOS currently have, having said that I believe its already very mature in terms of built in functionalities adding to that a very refreshing UI, bringing it at par with its competition! What do you think about the all new Windows Phone 7.5 platform? Will you be interested in buying one of the newly announced devices?